À la perfection | One quality, the finest. French artist Maurice Quentin de La Tour was born on September 5, 1704. His pastel portraits sparkle with personality. As the premier portraitist of the Enlightenment, his subjects included Voltaire, Rousseau, Madame Pompadour, and Louis XV. His musician father disapproved of his career plans, but he persisted, studying first in Paris, Rheims, and then London. He was untraditional in the sense that he sought out artists for coaching rather than entering formal art school. 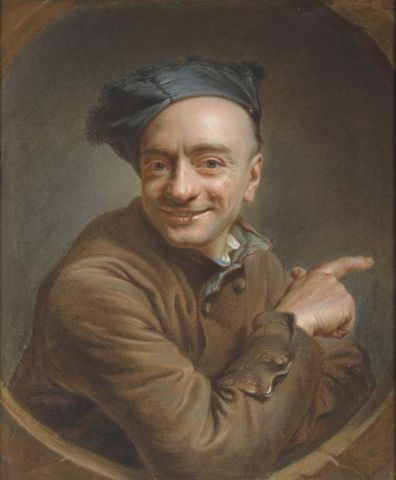 De La Tour copied the great masters, perfecting his technique. His acceptance to exhibit in the Salon was a great success and he was soon flooded with commissions despite the fact that pastels were considered to be inferior to oils, and portraits were considered inferior to historical subjects. De La Tour delighted in making his subjects wait for their chance to be painted – even Madame Pompadour, the king’s mistress. When a new portraitist was rising in preeminence De La Tour asked the other man to draw him, while secretly working on a self-portrait at the same time. He made sure the two portraits were exhibited side-by-side so that his superior technique was evident to all. He was honored by being named portraitist to the king in 1750. He remembered his home town of Saint-Quentin by engaging in charitable works, including an art school. Sadly, his later years were plagued with mental illness. He died at age 83. This entry was posted in Art, People and tagged Age of Enlightenment, À la perfection, Jean Jacques Rousseau, Louis XV, Madame Pompadour, Maurice Quentin de La Tour, Portrait, Voltaire. Bookmark the permalink.